Kill Bill, both volume 1 and 2, are absolutely gorgeous! The art direction is beautiful! The camera angles are perfect… just Gorgeous! The lighting, the sound, the dialogs… and of course, the details! No one works with small details the way Quentin does. KILL BILL VOL. 1 The acclaimed film from groundbreaking writer and director Quentin Tarantino (PULP FICTION, JACKIE BROWN), KILL BILL VOLUME 1 stars Uma Thurman (PULP FICTION), Lucy Liu (CHARLIE’S ANGELS, CHICAGO), and Vivica A. Fox (TWO CAN PLAY THAT GAME) in an astonishing, action-packed thriller about brutal betrayal and an epic vendetta! Four years after taking a bullet in the head at her own wedding, The Bride (Thurman) emerges from a coma and decides it’s time for payback…with a vengeance! Having been gunned down by her former boss (David Carradine) and his deadly squad of international assassins, it’s a kill-or-be-killed fight she didn’t start but is determined to finish! Loaded with explosive action and outrageous humor, it’s a must-see motion picture event that has critics everywhere raving! KILL BILL VOL. 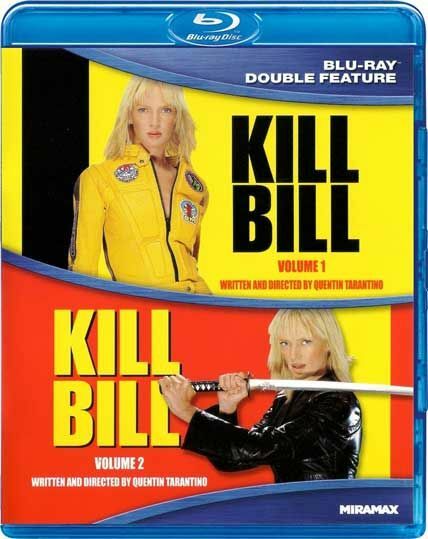 2 With this thrilling, must-see movie event, writer and director Quentin Tarantino (PULP FICTION) completes the action-packed quest for revenge begun by The Bride (Uma Thurman) in KILL BILL VOL. 1! Having already crossed two names from her Death List, the Bride is back with a vengeance and taking aim at Budd (Michael Madsen) and Elle Driver (Daryl Hannah), the only survivors from the squad of assassins who betrayed her four years earlier. It’s all leading up to the ultimate confrontation with Bill (David Carradine), The Bride’s former master and the man who ordered her execution! As the acclaimed follow-up to the instant classic VOL. 1 — you know all about the unlimited action and humor, but until you’ve seen KILL BILL VOL. 2, you only know half the story!